Escape The Fate made their return to the Omaha area on Thursday, May 23rd at The Waiting Room. Backstage Entertainment got a chance to sit down with Craig Mabbitt and Robert Ortiz before the show to talk about the tour, new album, and other fun submitted questions. Some of the topics the guys talked about in the interview were things like what they do in their free time when they’re not on stage, what happens when band members get sick, how they interact with fans at shows, and more. Talking about interacting with fans, the Escape The Fate tour bus parked right in front of the venue that night and for those of you who have been to The Waiting Room, you know there’s only a sidewalk that separates the street from the entrance. Fans waited outside the bus just to get a chance to meet the guys and they talk about how awesome that it and how they love interacting and hanging out with their fans. During the interview Robert was sick and losing his voice as it was going around the bus and Craig was being extra careful and trying everything he could to prevent himself from being sick. 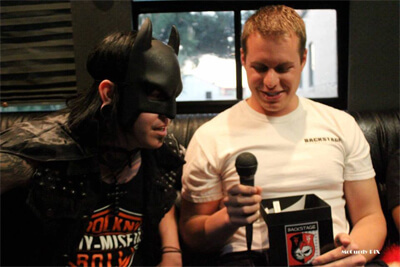 Another highlight from the interview found Craig acting like a superhero while answering one of the questions from the “BSE Box.” He happened to have a Batman costume on the bus and dressed up during the question. You can tell by watching the interview that these guys love to have fun and love touring to share their music with current and new fans. Be sure to get their new album, “Ungrateful,” in stores now. Also check below to click on the interview link and see it for yourself as well as photos from the night. Make sure to check out the links below for our interview and photos from the interview and show on Backstage Entertainment’s page.